Bolivia Flags. History of the Bolivian Flag and National Emblems. Bolivia Facts. The flags of Bolivia didn't always look like they do today. On the 17th of August, 1825, just eleven days after Bolivia declared its independence from Spain, the first Bolivian flag and crest, or cot of arms, were created. Its stripes were green-red-green, with the red stripe being slightly wider than the other two. Five stars were sewn onto the wider red stripe, that represents the five provinces the country had at the time: La Paz, Potosí, Cochabamba, Chuquisaca, and Santa Cruz. It is said Simón Bolivar himself waved it atop the Cerro Rico in Potosí. August 17th is "Día de la Bandera". This version was modified on the 26th of July, 1826 when Congress changed the color of the upper green stripe to yellow making it yellow-red-green. The 5 stars on the red stripe were replaced by a national coat of arms. 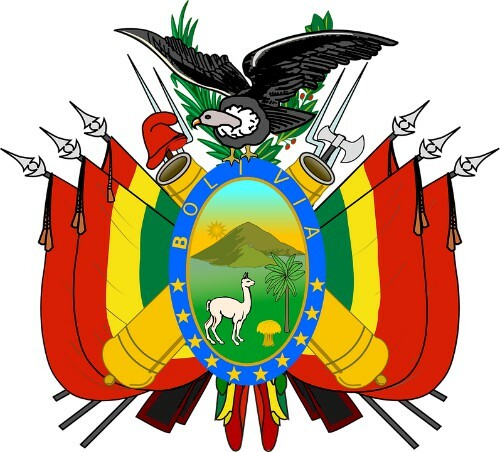 Red represents blood lost during the battles for independence, yellow represents the country’s great mineral richness, and green represents its territory and lush vegetation. Bolivia's new constitution establishes the whipala as a second national emblem. 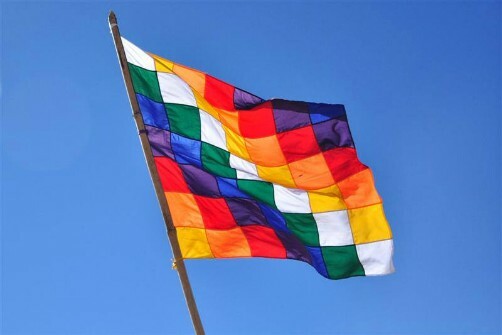 On August 4th 2009, Bolivian President Evo Morales issued a decree mandating the whipala be flown to the left of the red-yellow-green Bolivian national flag in all public areas and buildings including schools and classrooms, AND in all public homes. Because the whipala was adopted in the 1970's as a symbol of the Andean peoples of Western Bolivia, most people in Eastern Bolivia and other regions (who are of completely different ethnic origins) do not consider it a symbol that represents their beliefs, history, traditions, cultures or political views. This new decree caused great tension. Eastern Bolivian public authorities and private citizens have declared their refusal to fly the whipala, especially in their homes, and consider this an attempt to impose another culture upon them. You can read more about the whipala and see what it looks like by clicking on the link above. Click to read about how we traditionally celebrate Bolivia Independence Day. 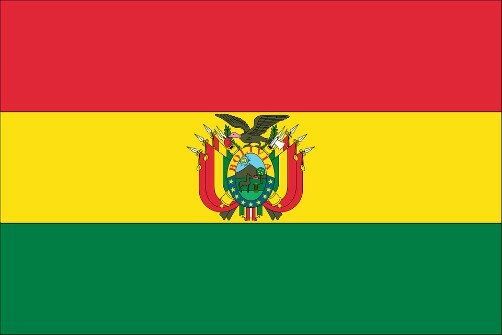 Each of Bolivia's nine departments (states) has its own flag as well. Below I've listed them along with the name of the capital city of each department. Department of La Paz. Capital city is Nuestra Señora de La Paz. Department of Oruro. Capital city is Oruro. Department of Pando. Capital city is Cobija. Department of Potosí. Capital city is Potosí. Department of Chuquisaca. Capital city is Sucre. Department of Cochabamba. Capital city is Cochabamba. Department of Tarija. Capital city is Tarija. Department of Beni. Capital city is Trinidad. Department of Santa Cruz. Capital city is Santa Cruz de la Sierra.